Morocco’s distinctive landscapes and enduring cultural heritage offer an enticing journey into the heart of North Africa. Part of Africa yet markedly different, Morocco is a fascinating study in contrasts. Old world medinas with noisy, narrow, winding lanes vie for attention with fashionable cafés, boutique shops and modern city centers. 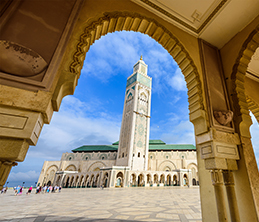 Sophisticated coastal cities such as Casablanca and Rabat boast an abundance of long white beaches, picturesque rocky coves and classic resorts. The imperial cities of Meknes and Fes showcase fine examples of Islamic architecture and tradition. Inland cities are warm and exotic, set among hills and palm groves. The rugged, snow-capped Atlas Mountains stretch 2,414 kilometers/1,500 miles through Morocco and beyond. Berber tribes have lived in the region for thousands of years, and were first mentioned in the writings of ancient Egyptians. Morocco’s fascinating oases have engendered many tales, and encompass old villages and long-established palm groves. The location of oases has been historically vital to trade and transportation routes through the desert. Old villages such as Aït-Benhaddou, a UNESCO World Heritage Site, still serve as strongholds that protect Berber lifestyle, culture, music and art. The country is also rich in Jewish heritage, with the first migration into this area coming after the destruction of the Second Temple in Jerusalem; a second wave arrived from the Iberian Peninsula in the period immediately preceding and following the 1492 Alhambra Decree, when Jews were expelled from the kingdoms of Spain and Portugal. At its peak in the 1940s, Morocco’s Jewish population exceeded 250,000 people. Jewish heritage is seen throughout the country from the Mellah and Roben Ben Sadoun Synagogue in Fes to the coastal town of Safi, known as Little Jerusalem. Like the intricate design of a Berber rug, Morocco weaves a spell that lasts a lifetime. I slip away from camp and walk toward the night. The stars grow bold out of the horizon as the evening sands soft as rabbit’s fur flow around my ankles with each step, cool as silk. The Sahara moon splashes over the dunes, casting traceable shadows beneath the sparse bushes as stars form a dome edge to edge. Nature’s night lights hang close enough for me to pluck out of the sky and tuck into my pocket. 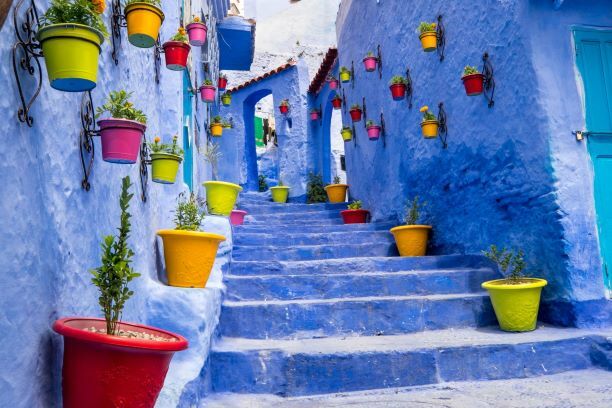 "Every year I visit Morocco and I am amazed by two things: how much the country has to offer, and how little of it is really being done right. Morocco has long been known for its riads, the Atlas Mountains, the Sahara desert and the excruciatingly long drives. This is reflected in nearly every itinerary across the board. This journey is designed to focus more on the adventure side plus the luxury aspect of Morocco and minimize some of those long desert drives. It takes you inside a Berber home, camping on the great sand dunes and into the dramatic gorges of Todra." Explore ancient Marrakech and its colorful bazaars, Spanish Moorish architecture and iconic sights as well as the small Berber villages of the High Atlas Range. Enjoy a mobile tented camp experience in the lunar-like landscapes of the Agafay Desert and hike the rugged Atlas Mountains dominated by Djebel Toubkal. Venture out on excursions into the desert by 4x4 vehicles or mountain bike; by mule, horse or camel; or by quad bikes or buggies. On a custom Morocco tour savor an adventure in this ancient and fascinating land that features history and legends, imperial cities and fascinating bazaars, dramatic landscapes and the traditional culture of the Berbers. Camp out in the desert and discover the ancient alleyways of royal cities. Discover the wealth of Berber culture found in the towns and villages of Morocco's far south, which have survived for thousands of years.